How long is the solar payback in your neighbourhood? A new report published by The Guardian highlights the difference in the time it takes for solar panels in different regions to payback their investment. It’s no great surprise that southern cities get on average more hours of sunshine per year than the north, but Met Office statistics show that the difference is not actually that great. Unsurprisingly, cities in the south came out tops, with Plymouth, Exeter and Truro named as the three cities with the highest return on investment for domestic solar panel installations. In Plymouth, it takes only 8.4 years for a domestic solar panel installation to pay for itself, compared with the national average of 9.5 years. 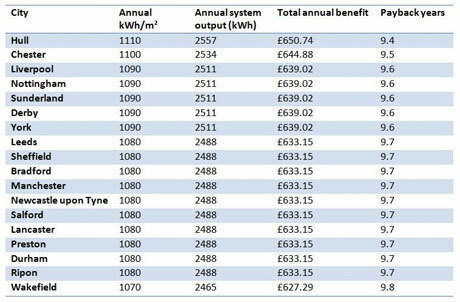 You will notice on the table to the right that all the northern regions show payback will be less than 10 years, and given that the term in which the FiT payments are guaranteed for is 20 years, you can see why solar is still such a popular investment. To read the full article – click here. It won’t be long to take back what we invest in solar. Yeah, maybe it depends in the place we’re living. We just need the sun!